At Living Libations we love to spend long summer days playing in the sun’s rays. For hours and hours spend in the sun, it is great to wear a hat and organic cotton clothing. Yet, sometimes wearing a shirt and hat just won’t do! Everybody Loves the Sunshine with Zinc is a handcrafted formula that masterly mixes a bouquet of sun-skin harmonizing botanicals with ray-reflecting zinc to extend your outdoor play and keep your sun-kissed skin smooth and glowing. For fun days of sun play! Made with 20% non-nano particle uncoated zinc oxide and organic sun-loving botanicals of jojoba, virgin coconut crème, red raspberry seed, seabuckthorn berry, cacao butter, beeswax, tamanu and regenerating essences of helichrysum, lavender, cape chamomile, ginger, geranium, palmarosa, rose otto, carrot, ginger, frankincense, turmeric, calendula, sandalwood, and thyme linalool. 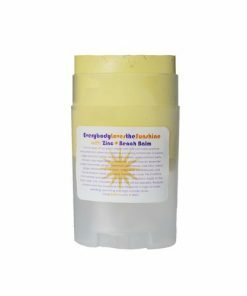 Après sun, apply Everybody Loves the Sunshine Oil to restore and adore sun soaked skin. 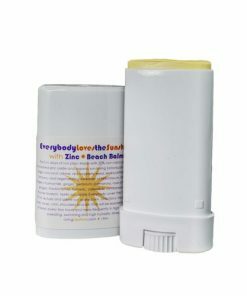 *Please note this is the ingredients list for our new Everybody Loves the Sunshine Beach Balm with Zinc. There was a printing error with the labels and organic cacao butter and beeswax are in this product. Everybody Loves the Sunshine with Zinc provides a pure, luxurious sun-shade from UV rays for days and days of summertime play. If you long for a whole day spent in the sun, invite zinc to your summer party! 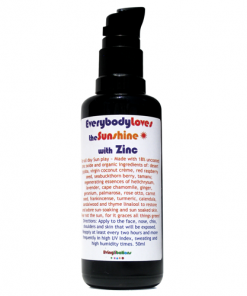 Everybody Loves the Sunshine with Zinc is the same delectable sun harmonizing formula as Everybody Loves the Sunshine with the addition of non-nano particle, uncoated zinc oxide. Un-coated zinc oxide reflects the sun’s rays, rather than absorb them, providing a natural sunshade. jojoba, coco-crème, seabuckthorn berry, non-nano particle uncoated zinc oxide, raspberry seed, tamanu, schizandra, immortelle, carrot, rose otto, cape chamomile, frankincense, sandalwood, ginger geranium, thyme linalool, turmeric, calendula, and palmarosa. We do not want to be burned by our dear friend, the sun. 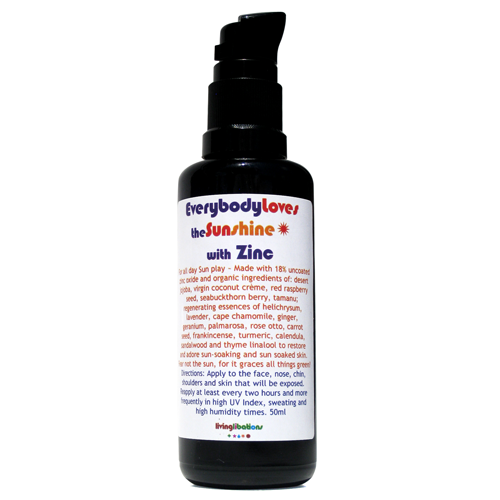 Everybody Loves the Sunshine with Zinc offers the maximum sun-shade from UVA and UVB rays. Apply a few squirts to all exposed skin, and be extra careful with your nose, chin, and shoulders. 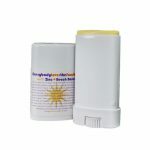 Reapply at least every two hours and more frequently when the UV index is high and when you are sweating. 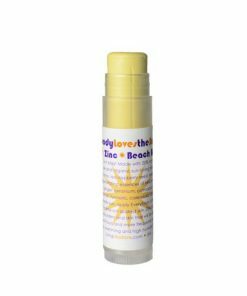 If your skin starts to feel warm, you will know it is time to reapply or seek shade. 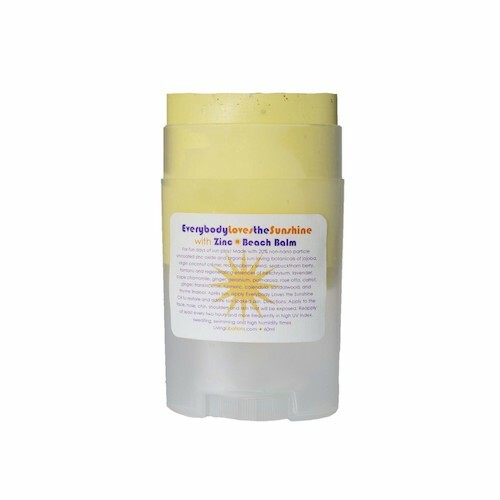 If you ever do burn, aloe and/or a squirt of Everybody Loves the Sunshine with an extra drop or two of peppermint or lavender offers cooling relief and quickens healing. Organic Ingredients: jojoba, coco-crème, seabuckthorn berry, non-nano particle uncoated zinc oxide*, raspberry seed, tamanu, schizandra, immortelle, carrot, rose otto, cape chamomile, frankincense, sandalwood, ginger geranium, thyme linalool, turmeric, calendula, and palmarosa.